Diana Taurasi is the leading scorer in the EuroLeague Women competition this season with a total of 178 points in 8 games. She was again the player of the match with 22 points and 11 rebounds. She also fired in 4-from-9 from beyond the arc. However the big attraction for this game was the reappearance of Sue Bird, who missed the first half of the season recovering from injury. She took a while to get into her stride. But once she got her bearing there was no stopping her, finishing with 7 points, 3 steals and 4 assists as Spartak Moscow held off Szeviép (77-58). Game reportSpartak Moscow Region required five minutes to gain control of the game (10-8) and led (25-15) by the end of the first quarter. The two teams matched each other over the next two stanzas. 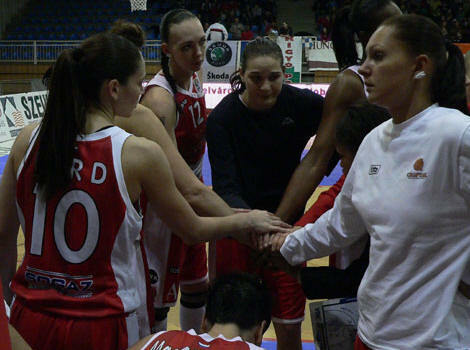 Spartak went into the final quarter leading (61-51) thanks to three-pointers by Taurasi during the third quarter. The final quarter started slowly and neither side scored for the first two and a half minutes. Olena Zherzherunova broke the deadlock for the hosts from Hungary. Spartak Moscow responded by scoring the next 9 points starting with a trey by Anete Jekabsone-Zogota. Spartak, leading (70-52) with four minutes left to play, controlled the pace of the game for the remaining time to win (77-58). This game had to be rescheduled due to the death of Shabtai Von Kalmanovic. Sylvia Fowles was the only other player from Spartak Moscow in double digits with 11 points. Ilona Korstin added 9 points. Emöke Füresz (right) had 16 points while Vaida Sipaviciute and Zherzherunova each had 15 points for the hosts. Sue Bird said after the game "Szeviép's team is a competitive one; I felt myself good on the court, I've enjoyed the entire game."